Frank is the Principal Dentist and co-owner of Darlinghurst Dental, a modern dental practice in the heart of Darlinghurst. We offer a full service dental practice, with a high emphasis on delivering evidence based treatments with outstanding customer service. This ensures that you get the best possible outcome from your dental treatment and that it easy, convenient and comfortable for you. Frank takes a thorough and measured approach to all dental treatment and dental assessment. This ensures nothing is missed and that there is no rushing treatments. It may take a little longer, but is less stressful for the patient and leads to better dental outcomes. Dental treatment is often confusing, so it is important to have a thorough discussion about all treatment options. Most dental problems are avoidable and often we can do damage to our teeth without even knowing. Instead of just treating problems with your teeth, Frank thinks it is hugely important to get to the root cause of the problem in the first place, so as to avoid future unnecessary dental treatment. Some simple lifestyle changes can mean the world of difference to your dental health. 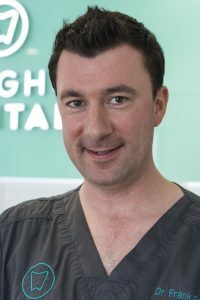 Frank has worked as a general dentist in a number of different practices and has worked in both small and large practices in Australia and both private and NHS in the UK. The different types of practice offer a different challenge in terms of treatment provision, but as with any healthcare provision, the most important factor is to be able to work in a team approach, taking the patients’ needs into consideration to deliver a high level of customer service. Darlinghurst Dental gives superior customer service to our dental patients. Frank enjoys the many varied dining experiences available in Darlinghurst, where he lives. The local music acts and proximity to excellent venues are a constant source of enjoyment. If you have any music that you want to share, let him know and he will endeavour to play it while you attend your dentist appointment. Having comforting music can make your dental visit a more positive experience. Trained as a General dentist, Frank takes a special interest in Invisalign and restoration of implants and continues his education and training in these areas. Frank is great at working with children due to his vast experience when working under NHS in UK. Frank carries out all general treatments, such as periodontal treatment, restorative dental treatment, endodontics (root canal treatment) and minor oral surgery (extractions). Access our live appointment book 24/7. Book a confirmed dentist appointment with Darlinghurst Dental that is convenient for you. Join our dental practice mailing list for current offers and a special welcome offer for your dental check up. Engage with Darlinghurst Dental in a way that is convenient for you.